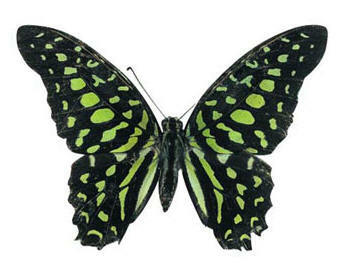 The Tailed Jay (also known as the Green Spotted Triangle)is a member of the Papiliondae family. The Tailed Jay has a distinctive look with apple-green spots on a speckled brown ground and has “stubby tails”. The adults fly very rapidly and are often seen feeding on lantana and other flowers on the margins of rainforest. When alighting on a flower head the wings are kept moving rapidly in what can best be described as a nervous flutter.